My goal is to educate, support, and inspire honest communication about the choice not to parent. In a world of Mom and Apple Pie, Living Childfree-by-Choice is your connection so you don’t feel isolated and alone.If you’d like to share, question, vent, or just see what others have to say, go to my Blog . I have a new Facebook page. Search for it by entering “confessions of a childfree woman” in the Facebook search bar. questioning whether you want children. feeling unwanted family pressure to have children. happy being a parent but aren’t sure you want more children. feeling confused and/or upset by the frustrations of raising children. facing menopause and fear you’ll regret not having children. a stepparent often feeling bewildered by your role. 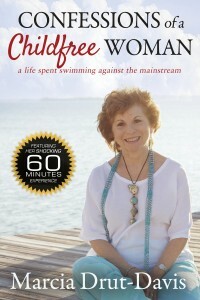 My book, Confessions of a Childfree Woman: a life spent swimming against the mainstream, is now available on Amazon.com. in both Ebook and printed version. It feels amazing to share my brainchild after years of hard work and perseverance. If you don’t have a Kindle click on the following link to get the free Kindle App: Free Kindle Reading Apps. If you have any questions, contact me with this contact form. To see Support Organizations & Resources for living childfree-by-choice, download my resource guide in the sidebar to the left. We’ll continue to add information and features to the site as the need arises. 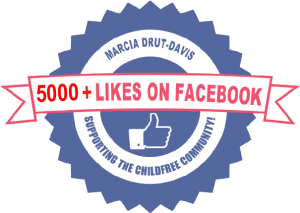 Visit often to learn more about living childfree-by-choice with Marcia Drut – Davis.